As I said in my account of my day long visit to Dreamworld late last year, Australia really doesn’t do theme parks to the same level that the United States does. The list of Australian theme parks is pitiably small and sadly, what lacks in quantity isn’t necessarily made up for in quality. Of the seven or eight theme parks in Australia, I’d say only Dreamworld feels like a theme park in the traditional sense. Neighboring Movie World does have a lot of likable features (and I need to visit it in the light of day to give it a proper chance) – but the sheer size and scale of Dream World puts its head and shoulders above its Aussie competitors. I grew up with Dreamworld as a semi regular fixture in my life. My family would periodically spend a very expensive day exploring the park when I was young, I returned once in the tenth grade for a high school excursion, and visited one last time as a college student with my family. But heading back during last year’s Queensland tour, I hit up Dream world alone. Here are my thoughts. 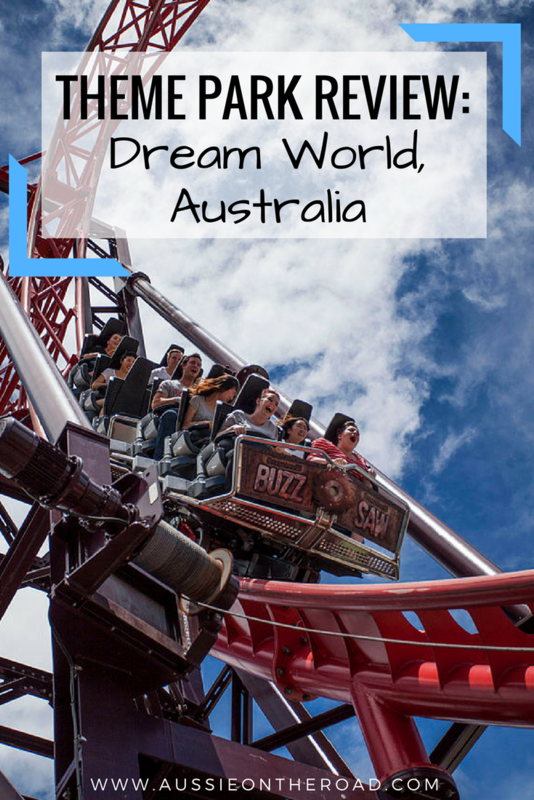 Situated on the tourist laden strip that is the Gold Coast, Dreamworld is based quite close to rivals Sea World and Movie World in what is something of a theme park district in Australia. In fact, there aren’t any theme parks of any real size anywhere else in the country. Being so close to one of Australia’s big tourist spots, Dreamworld is almost always busy. Regular buses run out from the city to the parks (for the princely sum of around $7) and there are plenty of parking spaces for those wanting to make the drive out. Dreamworld charges a heart-stopping $80 for adults to enter the park, but that’s the kind of high price you can expect pretty much anywhere in Australia. An extra $10 gets you into the park an hour early and is a good way to get all of the thrill rides done before the queues pick up. I figure if you’ve already spent $80 on tickets, it’s worth an extra $10 to not stand amidst the masses of humanity waiting to ride the Tower of Terror 2. 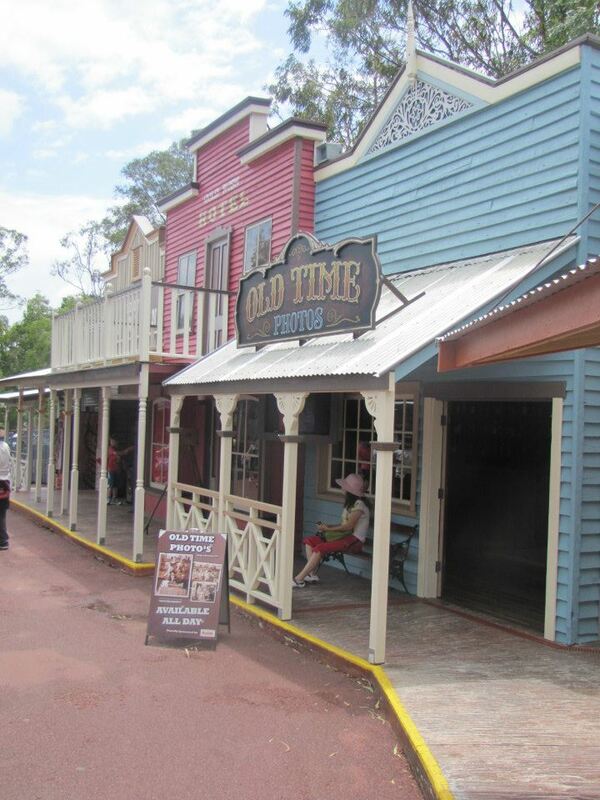 Like most major theme parks, Dreamworld features another of themed areas including Gold Rush, Ocean Parade, and the unique Tiger Island precinct. You can find out more by checking out the Dream World website. Dreamworld prides itself on its Big 7 Thrill Rides and they really do have a very good selection of heart-rate lifting coasters and thrilling drops. Four roller coasters – the Cyclone, Buzzsaw, Tower of Terror 2, and Mick Doohan’s Moto Coaster – join the dizzying Giant Drop and the stomach-churning Claw & Wipe Out to give thrillseekers a veritable smorgasbord of options. I’ve ridden all but the Giant Drop. It had developed a collosal queue by the time I made my way to it. 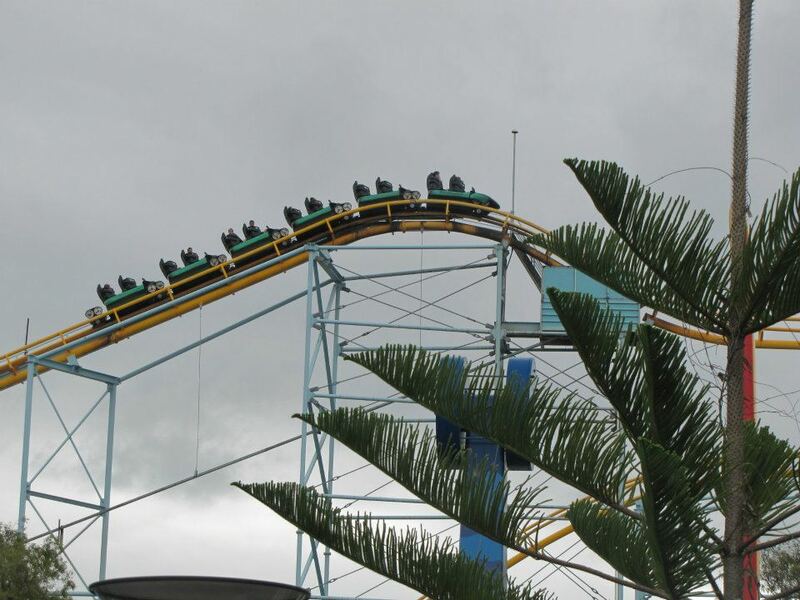 Cyclone: A traditional loops and corkscrews style coaster transplanted from Luna Park in Sydney. Tower of Terror 2: Previously the world’s tallest roller coaster. Launches you backwards at over 100 miles an hour up a 115m tall tower with over six seconds of very groovy weightlessness. 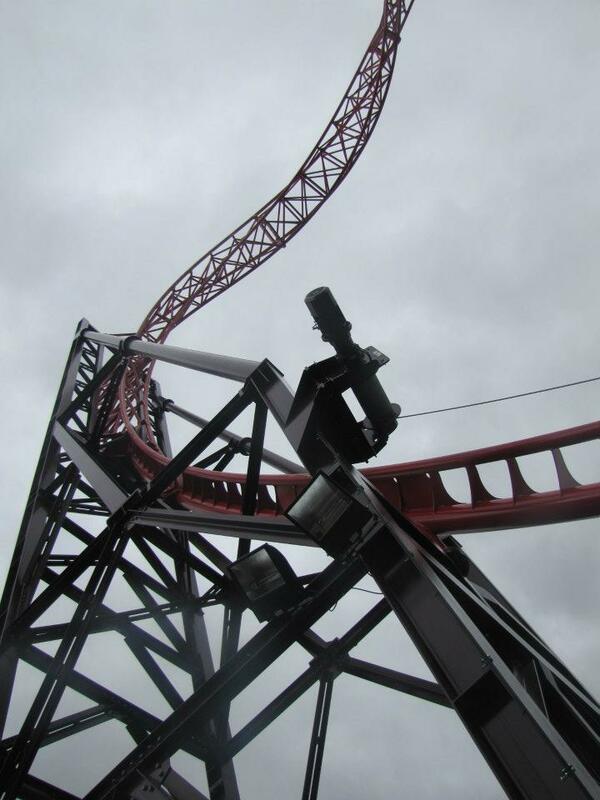 Buzzsaw: The park’s newest ride. A heart-stopping sky loop roller coaster. Mick Doohan Moto Coaster: A relatively tame motor-bike themed ride with lots of banking turns. The Claw: My favorite ride. A massive gyro swing with some dizzying views. Wipeout: A Waikiki Wave Flip style ride. Lots of upside down time over a ‘shark tank’. The Giant Drop: The world’s tallest vertical drop ride features a 119m drop. With seven pretty epic rides scattered across the park, thrill junkies aren’t going to be disappointed. There’s also the early entry option to ensure you get multiple rides in. I hit Buzzsaw twice and the Claw three times during my visit. Most of my experiences with Dreamworld have been as part of the family unit. I’ve got many fond memories of traipsing around the parks with my brothers and sister in tow while my mother surreptitiously flouted the park’s ‘no outside food rule’ by handing us pre-made sandwiches in an effort to stave the flow of money out of her purse. On that front, Dreamworld is a pricey prospect for a family. A day at the park for an average sized family is going to run around $260 plus the inevitable junk food and souvenirs in the park. 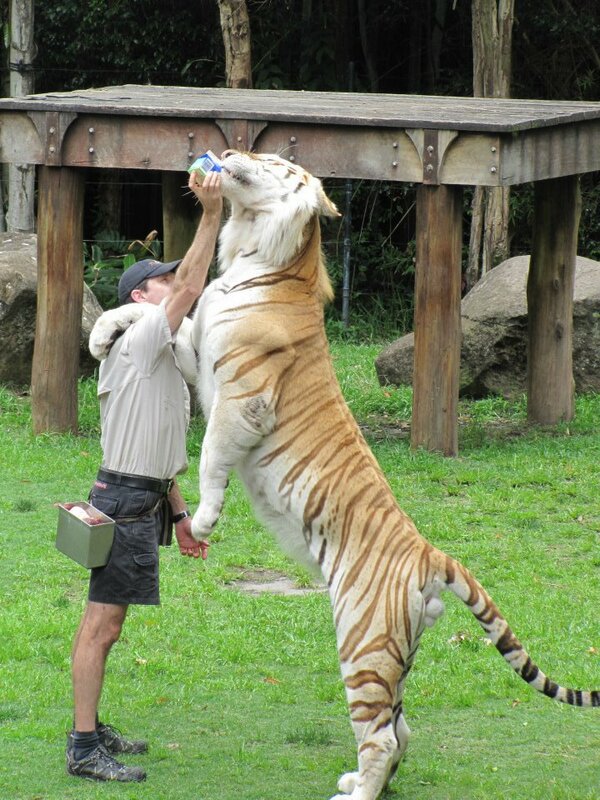 There are also a few non-ride related attractions in the park as well such as a pretty decent IMAX theatre, the Australian Wildlife Experience zoo, and the truly gorgeous Tiger Island – where Bengal and Sumatran tigers perform in a show designed to raise awareness as well as money for the endangered beauties. There’s also a live sheep sheering show for those interested in a bit of Aussie outback culture. A family really could spend a day exploring the park and not do it justice. 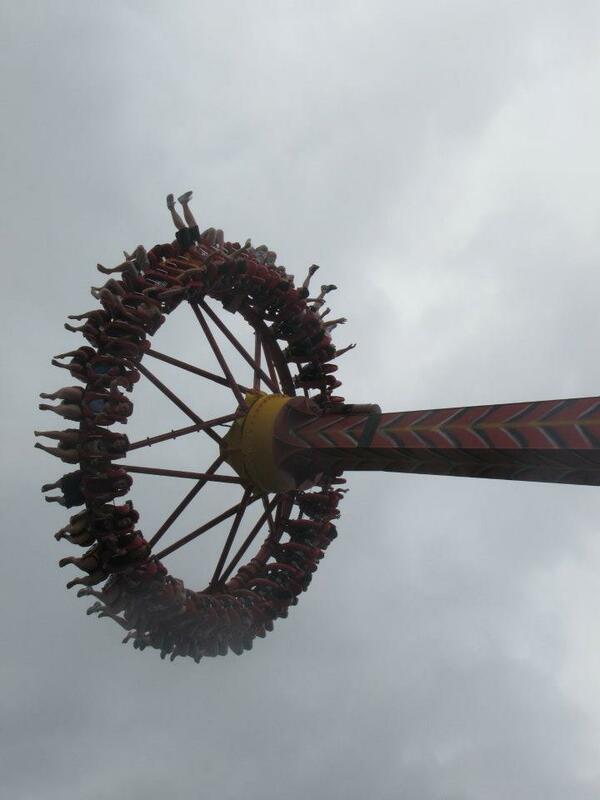 And that’s without jumping next door to White Water World – Dreamworld’s sister park. 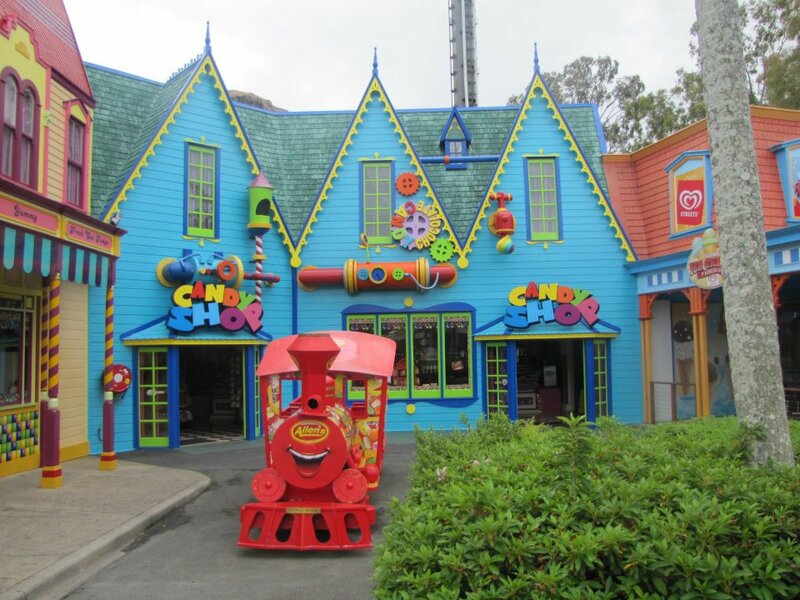 In addition to the swathe of family friendly rides and attractions mentioned above, Dreamworld is also home to a kid specific Wiggles World section named for the famous Australian group. With Dorothy the Dinosaur and Captain Feathersword strolling around the region and bright colors abounding, there’s no missing the kid friendly area of the park. 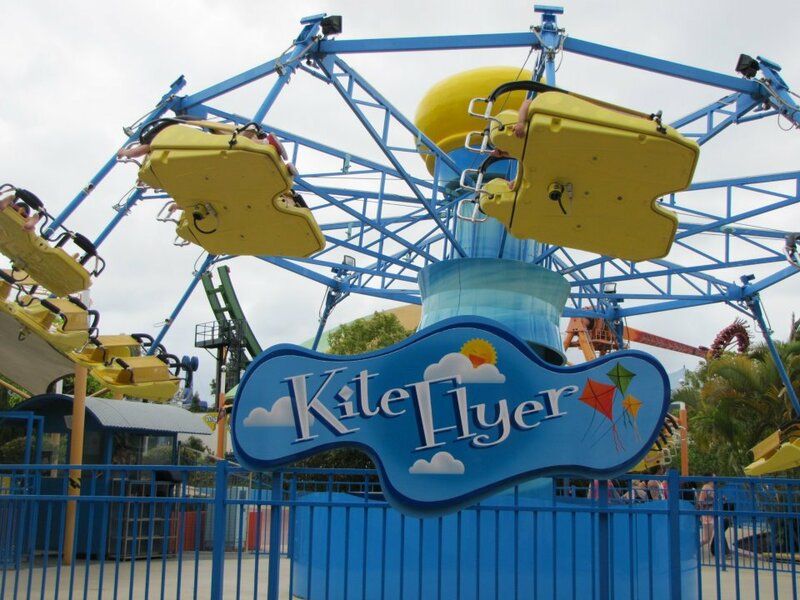 Kite Flyer – A lie down zooming ride. Avalanche – A classic Matterhorn. A childhood favorite. Sky Rocket – A kid friendly roller-coaster. Rainforest Rampage – Fire foam balls at one another. Epic! Mighty Go Round – Classic carousel. 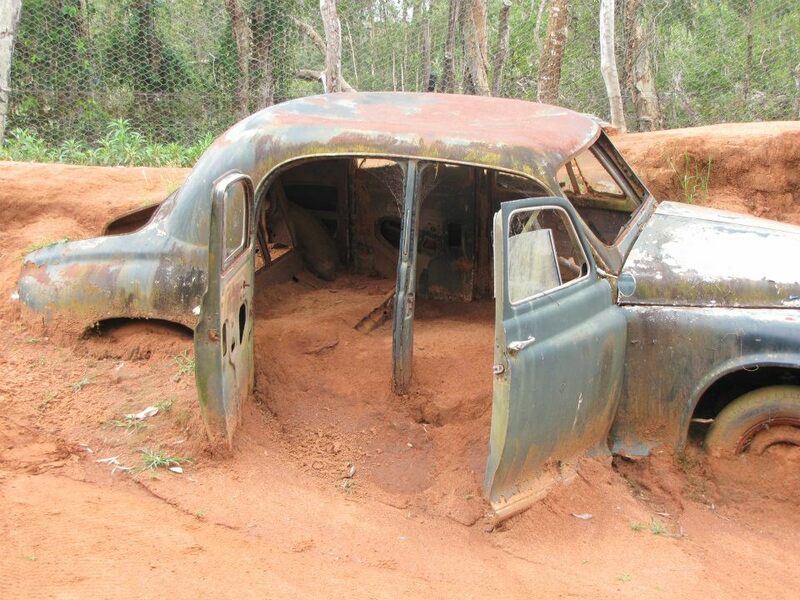 Avis Vintage Cars – Vintage cars on tracks. A childhood favorite as well. The Kite Flyer. Looks like fun. I’d also go so far as to say almost all of the family rides are kid friendly, although a few of them (such as the Shockwave) have height restrictions that would preclude the littlest of kids. Live entertainment in the form of Tiger Island, the Australian Wildlife Experience, and performances in the Dreambowl are also good ways to keep the little ones occupied. The Wildlife Experience in particular is a lot of fun – letting kids pet wallabies and get up close and personal with iconic Aussie animals. Dreamworld has a nice blend of the traditional theme park gaudiness and over the top design tangled with Australian touches such as gum trees, the koala mascot (Kenny), and the very Aussie stretch around the river boat ride, sheering demonstration, and Australian Wildlife Experience. The themed areas have a great deal of character, although only Gold Rush really feels 100% committed to the task with its dutsty roads, old timey stalls, and abundance of rust and cobwebs. Wiggles World is colorful and the coastal themed Ocean Parade has plenty of water and model sea-life on display, and the entrance area feels very Disney with its tall buildings, colorful walkways, and gigantic fountain. 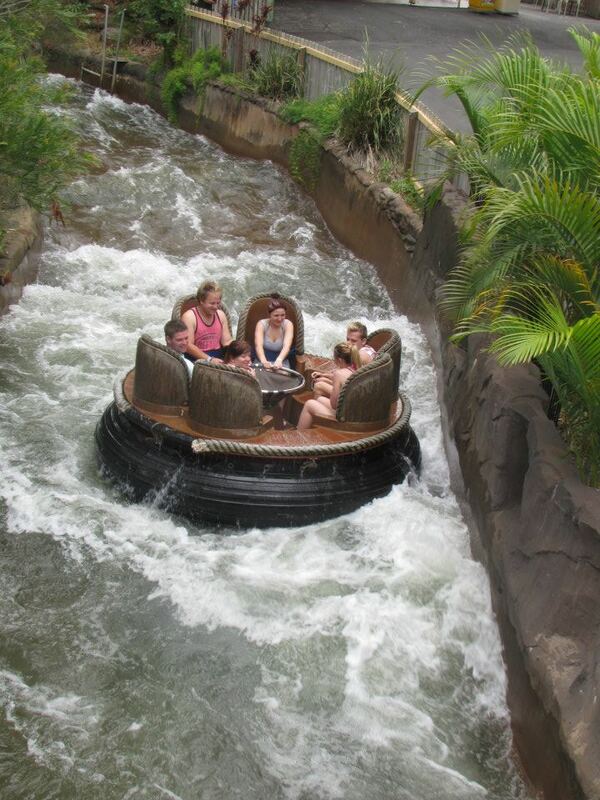 The near constant Gold Coast sun means your visit is almost certainly going to be on a warm day, which is good news if you wish to visit the neighboring Water Park or want to ride the enigmatic Flow Rider. There’s a pretty admirable selection of foods available at the park, although how much of it is open depends on the crowds in the park. My own visit saw only about one third of the hot dog stands, snow cone sellers, and pizza places open. 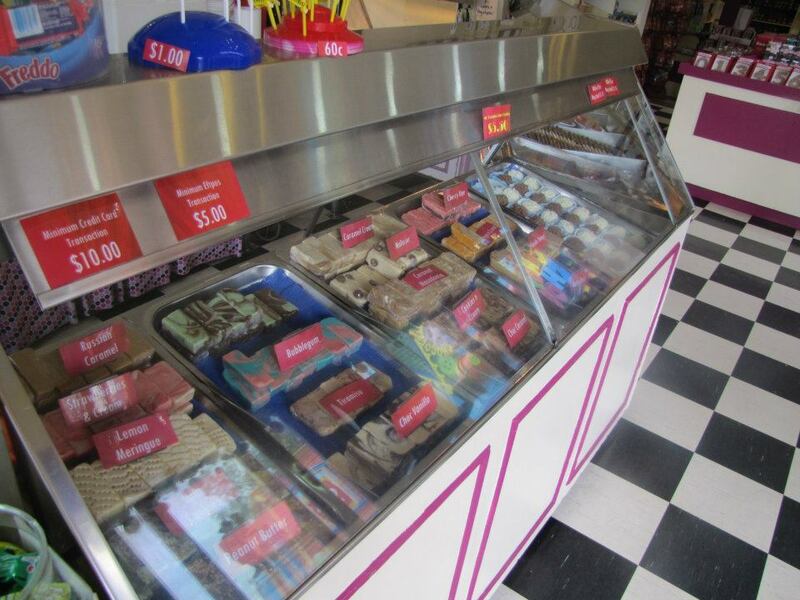 There’s a Boost juice on site for the remotely health conscious, as well as a very good candy and fudge store. I had a delicious lunch at the brasserie style buffet by the river for a relatively affordable $24. It’s close to a good old fashioned roast dinner with a little bit of Asian fusion mixed in. Very Aussie. The one drawback, as is the case in most theme parks, is the price. Everything at Dreamworld is just a little bit more expensive, so I can’t say I blame my mother for sneaking food in back in the day. The selection is ok without being remarkable. While others might say the the Giant Drop, Tower of Terror II, or Buzzsaw are where it’s at – no ride grabs my attention more than the underrated Claw. A massive Gyro Swing that moves at speeds of up to 75km and brings you to 240 degrees – the Claw is arguably my favorite ride in the world (thus far). I rode it three times during my recent visit and would have ridden it more had a bunch of kids fresh from school not commandeered it. It’s just a lot of fun – balancing fear factor with less physically jarring movements than a roller coaster or the Giant Drop boast. 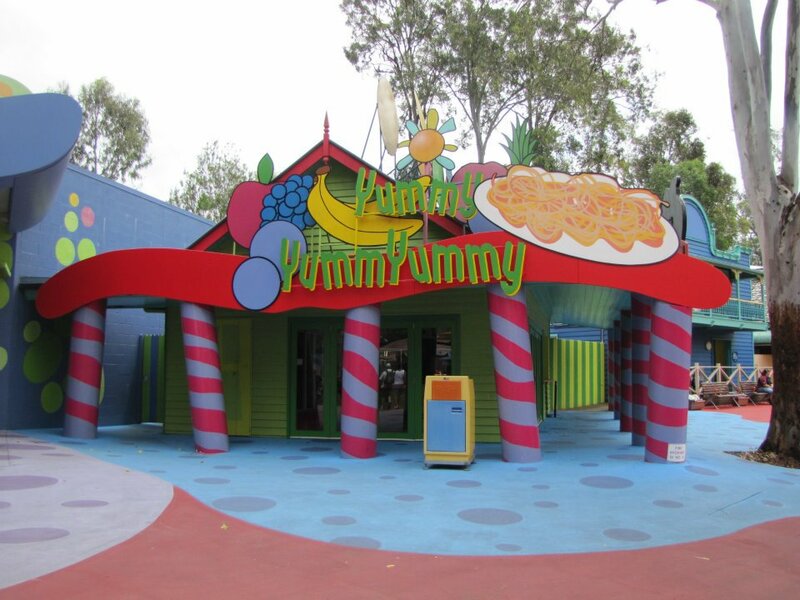 Australia’s biggest and best theme park does a pretty good job of not feeling like a rinky dink colonial knock-off of its American forebears. There’s enough size and spectacle to make it feel like a real theme park with just enough Aussie in it to not feel like a clone. While it boasts a grimace inducing price tag, that’s in line with the traditionally high prices you’ll come to expect when spending any amount of time in Australia. With great quality of life comes great cost. A day at Dreamworld is not a cheap prospect and it’s not particularly Australian to visit a theme park either, but there are a few very good reasons for a visit beyond the obvious rides. 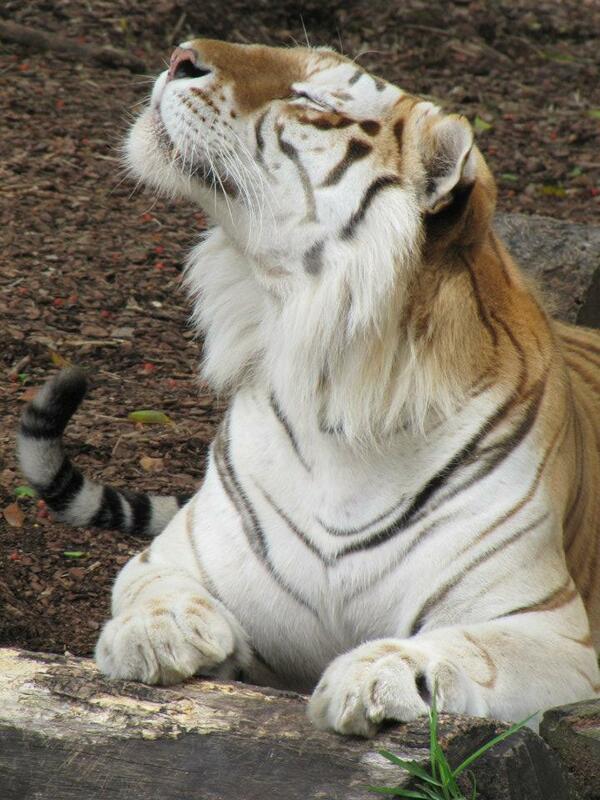 Tiger Island really does need to be seen and supported. The Australian Wildlife Experience is a passable zoo as well, and the opportunity is there to hug a koala or see a big saltwater crocodile in action. You pay a premium for the opportunity, but you won’t regret a day spent exploring Australia’s premier theme park. Have you ever been to Dreamworld? What’s your local theme park like?